The Polar S150 heart rate monitor is almost the same heart rate monitor as the S120. The S150, however, has speed and distance measurements for cyclists and comes with a bike mount, a wired speed sensor and an adapter. You can exercise and record your heart rate in 2 ways: Basic Use or Exercise Set. Basic Use: You exercise without any settings i.e. no heart rate zones or timers etc but heart rate information will be recorded. Exercise Set: You can manually set up to 3 heart rate training zones and up to 3 consecutive timers to guide your exercise. You can also program a time-based or a heart-rate-based recovery calculation. Record lap and split time up to a max of 50 laps. Lap time is elapsed time for one lap. Split time is total elapsed time from the start. A separate count up or count down timer can be used independently. The following information can be displayed real time: Current heart rate, average heart rate, heart rate as % of Max HR, stop watch, time of day, split and lap times, count down or count up timer, curent, maximum and average speed, trip distance. You can't see them all at the same time, but you can swap the display between them. Lap information includes lap number, split time, lap time, speed at the end of the lap, average heart rate, heart rate at end of the lap. Polar UpLink to transfer data from a PC to the heart rate monitor. This feature requires a Windows PC with a sound card and loudspeakers or headphones. Note: The additional S150 features over those of S120 are denoted in bold above. The Polar S150 heart rate monitor has the same runner specific features as the S120: lap time, split time, independent count down (or up) timer, and the Exercise Set feature consisting of 3 heart rate training zones and 3 consecutive timers. In addition, during cycling, the bike functions can be turned on to measure speed and distance information. Note: The Polar S150 heart rate monitor has been superseded. 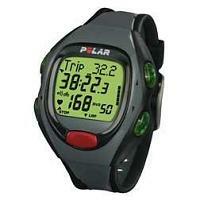 The next monitor in the Polar S series is the Polar S210 heart rate monitor.